Off-roads with pro-bike tour operator beginning cycling in countryside of Ben Tre after 2 hours driving from Saigon. Our pro-bike guides will help you to check your bikes with adjusting saddle heights and informing the rules of the roads then exploring vibrant lush green villages and local irrigation network for growing coconut trees. Then continue to cycle and take the time to explore and understand local life until crossing Co Chien River to Tra Vinh city. It is said that Khmer people and its community began in Mekong Delta as a small fishing villages and inhabited for centuries before the arrival of Vietnamese. In this morning, you will have a chance to meet and communicate with Khmer people at their traditional villages instead of traveling to Cambodia. By this afternoon, continue to explore countryside and have more opportunities to experience the truly unique cycle routes through surroundings of Tra On and Binh Minh before a short transfer to Can Tho city. The highlight of sightseeing is boating to the real floating market of Cai Rang. After your boat trip to floating market done, you will get off from boat and continue your adventure of biking to Rach Gia via to Vi Thanh city. You will cycle on narrow paths along natural creeks where you could meet friendly people along country roads, who loves to have their picture taken. There are many sampan boat factories along country roads, fishing nets alongside rivers to stop and admire. Guide was very helpful and changed routes according to feedback. I loved the routes through the villages. Only criticism is I would have liked to choose my bike. Although I was the correct size for my height. I woud have prefered to check before arriving at start point and have a choice of small bike. Thank you Viet and Cuong. It was so great and much better than I could ever imagine. There were interesting stories and knowledgeable of Vietnam shared by our guide Thang. It was a fabolous, trip but is was a little expensive. But we would like to go again when we saved enough money. I enjoyed stopping with local people having a good laugh! The food was deliious all the time, it felt like we were on a food tour not only a biking tour but on the second day we were very hungry when we came to the lunch stop. So maybe an extra snack if it takes long way before lunch. Check if the guest are hungry. In general, we really enjoyed this trip a lot and will share this as a memory for a long time. I was a little nervous before since I did not know how if all would work out, but our guide was with us all the time and the stops we made a long the way were all very interesting. Especially to get to know more about local production of rice and see the fields of rice in different stages. I also liked when we stopped to talk to all different women working with crafts along the paths! Great times! - Mekongbiketours.com and webpages which all lead to the same company was very confusing in the beginning. Not only confusing, you get a bit suspicious actually. And when the email about payment came from a totally new person and domain name than the one we have had contact with. We almost thought that there was something wrong. But it all works out then! Maybe you can get PayPal-account or safe payment over the web with credit card? Really enjoyed 4 day trip on the back roads. Cycle distances were great and we had plenty of stop. Dat is an excellent guide, very knowledgeable, friendly and helpful. It been a great way to see some of south Vietnam. Loved the network of paths through the villages. 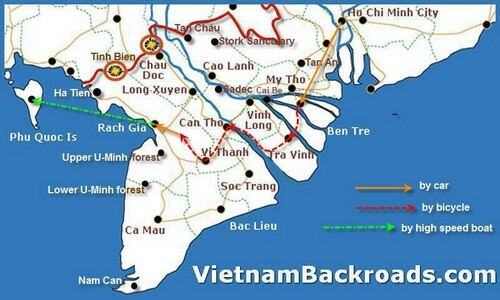 We would never have seen that without Vietnam Backroads. The hotels were very good.